The Differences Between the M16-A2 and the "A4"
The evolution of the Colt M-16 has been a constant change about every decade since the Vietnam War. The first M16 and Armalite AR-15 evolved into the M16A1 with modifications to the flash suppressor and attachments like the M204 grenade launcher. The M16A1 evolved to the M16A2 (aka M4) and the M16A3 and A4 which boast a list of changes that update the weapon for the varying needs of battle of the 21st century. Features: The M16A2 5.56mm rifle is a lightweight, air-cooled, gas-operated, magazine-fed, shoulder- or hip-fired weapon designed for either automatic fire (3-round bursts) or semiautomatic fire (single shot) through the use of a selector lever. The weapon has a fully adjustable rear sight. The bottom of the trigger guard opens to provide access to the trigger while wearing winter mittens. The upper receiver/barrel assembly has a fully adjustable rear sight and a compensator which helps keep the muzzle down during firing. The steel bolt group and barrel extension are designed with locking lugs which lock the bolt group to the barrel extension allowing the rifle to have a lightweight aluminum receiver. 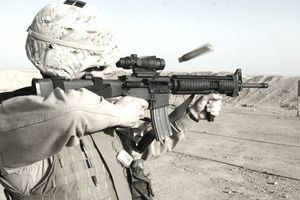 The Colt M16A4 Rifle is the fourth generation of the M16 series weapon system. Since Vietnam, the M16 has been the weapon of choice for the US and many of our allies for ground combat action. The A4, with a flat top upper receiver, a removable carrying handle, collapsible buttstock, and an integral rail mounting system for mounting of optics and other devices (lights/grenade launcher M203). The M16A4 Rifle in combination with the M5 Rail Adapter forms the Modular Weapon System (rifle version) which provide soldiers the flexibility to configure their weapons with those accessories required to fulfill an assigned mission. There are no differences between the internal dimensions of the M16A2 Rifle and the M16A4 Rifle. The M4 was produced in the 1990’s at the request of the US Special Forces, which is a version of the M16A2, designated M4 Carbine. The M4 has several improvements. It is basically the M16A2 rifle, fitted with retractable buttstock, a shorter barrel, handguards, removable carrying handle for the addition of optics on the now flat top fail, and also moved the gas port back a few inches. The changes enabled the M16A3 and A4 to be quickly adjustable when needed for different mission types. The new updates to this weapon system enable soldiers, marines and special operations members to conduct a variety of operations from close quarters battle to a wide and open battlefield in the desert, jungle, and other environments. These are the changes and specifications that stayed the same.